The Edward Kidder Graham Faculty Service Award is a new award that will be conferred for the first time on this upcoming University Day, October 12. Our own Dave Owens will be the first recipient. Carolina’s public service mission gained its earliest and most eloquent expression nearly 100 years ago under the leadership of President Edward Kidder Graham. He believed that “the state and all its practical problems” were a legitimate field of University study and service. The campus motto during his tenure as president was “Write to the University When You Need Help,” and Carolina viewed itself as a “telephone central” that connected those interested in being served with those who could provide the service. Albert Coates was an undergraduate during Graham’s tenure as president, and he worked directly for him as a special assistant following his graduation. He called Graham “the greatest man I ever knew in flesh and blood, and he was the profoundest single influence in my life.” Graham inspired Coates and articulated a vision for University service that laid the groundwork for the Institute of Government. Dave Owens would be a deserving recipient regardless of his academic home, but his selection is perfect given his location in the campus unit that was guided by Graham’s spirit. Special congratulations to Dave for becoming the first recipient of the Graham Award. It is well deserved and you make us proud. The award will be presented at University Day, which will be celebrated at 11 a.m. on October 12 in Memorial Hall. I encourage you to come and cheer. 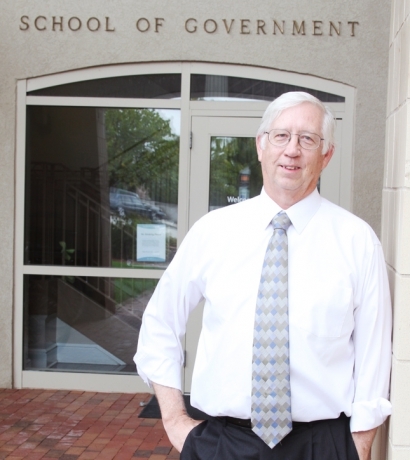 The speaker will be Tom Ross, a former Institute of Government faculty member who is better known to some people as President of the UNC System. Baseball trivia in honor of the upcoming playoffs that begin on Friday (featuring the Detroit Tigers): In the movie Field of Dreams, the character Archie “Moonlight” Graham is based on a real person who appeared as a late-inning substitute in one game for the New York Giants in 1905. Burt Lancaster plays the older “Doc” Graham in the movie. Graham was born in Fayetteville, North Carolina and played college baseball at Carolina. He was the cousin of Edward Kidder Graham and the brother of Frank Porter Graham, a later UNC President and a US Senator. Congratulations Dave! It could not possibly be more fitting nor greater deserved. You’ve “done the folks back home” proud! And, only you, Mike, could talk about Dave, both Presidents Graham, Albert Coates, and baseball in one post, and link them all together. I vote for an SOG party complete with Krispy Kremes in Dave’s honor. Speaking of linkages, unfortunately, President E.K. Graham died before KK’s was invented, but since his first cousin, Frank, was President when when KK’s came along, and since “Moonlight” was Frank’s brother, it seems that KK’s have some sort of linkage to this post. . . Thank you for highlighting Dave Owens in your post – what an honor for one of our finest professors! I’m sure President Graham and Mr. Coates would both send him an “AT-A-BOY!” if possible. However, I’ve always considered Dave a man of great wisdom – he was one of the members of the interview committee that hired me in 2000!!! Many well-deserved kudos to Dave! I am sure we can weave this award into the marketing we are doing for his second edition of Land Use Law in NC, which is at the printer. I love that the School can play the six degrees of Kevin Bacon game with Field of Dreams and a different Kevin (Kevin Costner). Now we can add Dave Owens to the end of the chain, and I am sure the School will continue adding links to that chain in the future. What a pleasure it has been to know Dave all these years. I know of no other faculty member at UNC CH more deserving of this award than Dave. I know I speak for all of the State’s planning community when I say “Thank You for all that you have done for us” and “CONGRATULATIONS!!!!!. Thanks, Bill. Dave has been a star and I’m glad that he is still continuing to serve. All the best.